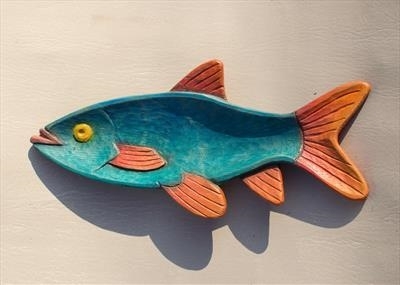 Carved wood dish shaped as a "roach". Made from ash, which is a tough resilient, wood.This is a slim line version. My other Roach design is fatter, wider. Can be a one-off or batch produced. Type and thickness of wood used may vary, as can the colours, and can be ordered to suit. If this one is no longer available as shown, I can, of course make another in the same wood and with the same colours. I usually paint with water colour, and seal with waterproof acrylic varnish. I have produced carved wood dishes, platters, items of domestic wood ware; signage for home, village and town; bed headboards; and carved sculptural furniture, alongside my fine art work since I began my carving business in 1985. I usually colour my work although customers may request a natural finish. I produce this kind of wood ware in various sizes, different colours, and in a variety of woods. Ash, sycamore, and lime are my preferred ones. Customers specify size required and may request other colours than those shown.